vickichristine: a little ditty by me, for free. every now and then, i use my spare time wisely and accomplish something worthwhile. ya know, other than napping and MAKING A HUMAN BEING! 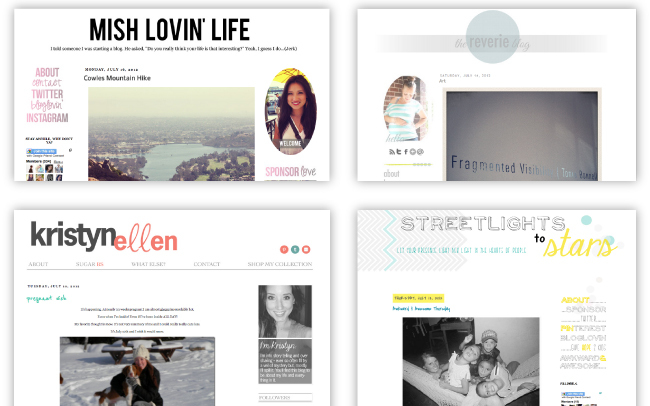 most recently, my accomplishments have come in the way of blog design. i've been lucky enough to have some interested parties willing to let me get jiggy with their blog spaces. i might be biased but c'mon - that there's my brain juice. clearly, i have a mild wild? obsession with white space. if you like what you see, then you should hop on over to sarah's blog and enter for a FREE blog design from yours truly! better than a finger in the eye, ain't they? good job, really. pitty I´m czech.. I LOVE them! You are so talented!!! I entered to win and Lord knows I need help. I'm still trying to make the damn button we talked about! LOL!! Oh my goodness...you are so talented. Love them all. I noticed Michelle's blog looking so lovely :) Didn't realize you were the woman behind the facelift. Well done!